The holograms in the above video feature fictitious imprints to demonstrate the visual effect of a custom imprint on a stock hologram label. All hologram labels on this page require a custom text imprint and/or a custom logo unless noted that "Imprint is Optional." All custom imprints are surface-printed. Most custom imprinted labels ship within 3 days after proof approval, unless noted otherwise in the product listing. We offer a variety of affordable stock hologram labels, which can be custom imprinted with your company name, logo, consecutive serial number and other features. There is no minimum order quantity. Your Custom Imprint is Registered! We maintain an imprint registry to assure that your unique imprint is only available to your company. The hologram images on this page offer more security than other generic holograms because the images have limited distribution and are not widely available from other companies on the internet. For the best service (and lower price), our plain and pre-printed holograms are available for immediate shipment. For plain silver holograms see Stock Silver Holograms; for plain transparent holograms see Stock Transparent Holograms. Custom imprinted holograms offer more security. Your custom text is included in the base pricing. We also offer optional logos and serial numbers. Custom imprinted silver holograms are highlighted on this page. We also offer Colored Holograms and Stock Transparent Holograms. An order for custom imprinting is normally ready to ship within 3 business days after proof approval. Stock imprint colors are black and red. We also offer green and blue as optional premium colors. Other options include two-color imprints and hidden flourescing inks. See OPTIONS for a full listing of optional features and pricing. We can also create a totally custom hologram product as well depending on your requirements. See the Custom Hologram Design section for more info on custom holograms. Custom holographic labels usually requires about 30 days to complete, but sometimes they can be completed in less time. The tamper evident security feature performs best on smooth non-porous surfaces, such as metal, PVC cards, plastics, clay-coated paper, etc. If you are affixing holograms to textured surfaces, uncoated paper, fabric, or other porous materials, we recommend you request our free samples and test prior to ordering. To design your custom imprint on-line, just click on the icon. Select the text, font, and placement. Then email us the proposed imprint. Or, call us and one of our sales reps will produce a custom proof for you. For added security, all hologram labels are tamper evident. If an attempt is made to remove (or reposition) the label from the original surface, the hologram image self-destructs. We offer the broadest selection of stock hologram stickers, which gives you more flexibility for affordable security. Silver hologram with random, repeating pattern of the words "ORIGINAL" and "AUTHENTIC". A custom imprint (text or logo) is optional on this hologram. To purchase this hologram sticker plain with no imprint, see our Stock Hologram Stickers. The base price includes a custom text imprint; logos require a one-time artwork fee. The standard imprint color is black or red. This hologram sticker includes a tamper evident feature, which self-destructs the hologram image when removed from the original surface. A custom imprint (text or logo) is required on this hologram. The base price includes a custom text imprint; logos require a one-time artwork fee. The standard imprint color is black or red. This simple hologram design complements most logos. This hologram sticker includes a tamper evident feature, which self-destructs the hologram image when removed from the original surface. The base price includes a text imprint; logos require a one-time artwork fee. The standard imprint color is black or red. This hologram sticker includes a tamper evident feature, which self-destructs the hologram image when removed from the original surface. Silver hologram with a random, repeating 3D pattern of the words "GENUINE", "AUTHENTIC", "SECURITY", and "VALID". Silver hologram wtih radial sweep pattern. Silver hologram with an offset radial sweep pattern. Silver hologram with "WARRANTY" and background repeating text "VOID IF REMOVED". A custom imprint (text or logo) is required on this hologram. The base price includes a custom text imprint; logos require a one-time artwork fee. The standard imprint color is black or red. Simple text or graphics look best on this hologram.. This hologram sticker includes a tamper evident feature, which self-destructs the hologram image when removed from the original surface. Silver hologram with "VALID" in a visually unique repeating pattern. Silver hologram with a random, repeating USA flag, star, and text "MADE IN USA" and "AUTHENTIC"
The base price includes a custom text imprint; logos require a one-time artwork fee. The standard imprint color is black or red. This simple hologram design complements most logos. This hologram sticker includes a tamper evident feature, which self-destructs the hologram image when removed from the original surface. 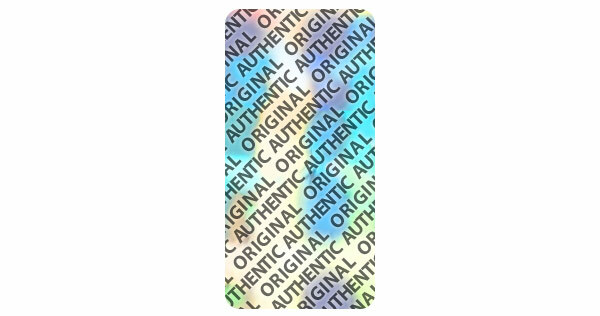 Silver hologram with a random, repeating pattern of the words "ORIGINAL" and "AUTHENTIC"
A custom imprint (text or logo) is optional on this hologram. Silver hologram with globe and radial sweep background. Silver hologram with "SECURE in the center surrounded by concentric circles with a repeating background of the word "SECURE" in small text . Silver hologram with random, repeating pattern of small radial sweeps. Silver hologram with background repeating text "VOID IF REMOVED" and plain silver at the bottom portion. Silver hologram with random, repeating pattern of a lock and key. Silver hologram label with the word "VALID" repeated in each direction on a geometric background..
Silver hologram with eagle encircled with stars on a radiating background. Silver hologram label with a unique random pattern of interweaving lines. Silver hologram label with the international wheelchair symbol with background of small VALID text. The wheelchair image is retricted to sell to governments only. No minimum order quantity. Silver hologram with "GENUINE" and background pattern of "GENUINE" & "AUTHENTIC". Hidden security features include microtext "AUTHENTIC" viewable with magnification and covert laser feature "OK" viewable with Red or Green laser pen. 1) Two lines of microtext (GENUINE AUTHENTIC) in the oval above and below the word GENUINE. The mircotext is only readable with magnification. To view the mircotext, locate the custom imprint outside of the oval area. 2) A hidden image (OK) which is viewable with laser pen. To view the hidden image, locate the custom imprint at the top or bottom of the hologram image. For more information on these security features, CLICK HERE. Silver hologram with "WARRANTY" at top center and background repeating text "WARRANTY VOID IF REMOVED". Note: Includes a center perforation, which enhances the frangibility of the sticker to improve security. Also, has an aggressive adhesive for indoor or outdoor applications. It is especially suited for powder-coated metal, bare plastics, or freezer applications (minimum application temperature of +10F). Note: Includes a center perforation, which enhances the frangibility of the sticker to improve security. A custom imprint (text or logo) is required on this hologram. Note: HOA20-169AA has an aggressive adhesive for indoor or outdoor applications. It is especially suited for powder-coated metal, bare plastics, or freezer applications (minimum application temperature of +10F). Includes a center perforation, which enhances the frangibility of the sticker to improve security. Note: HOA20-56PAA has an aggressive adhesive for indoor or outdoor applications. It is especially suited for powder-coated metal, bare plastics, or freezer applications (minimum application temperature of +10F). Includes a center perforation, which enhances the frangibility of the sticker to improve security. Note: Has an aggressive adhesive for indoor or outdoor applications suited for powder-coated metal, bare plastics, or freezer applications (minimum application temperature of +10F). Includes a center perforation, which enhances the frangibility of the sticker to improve security.